With the start of fiber boys, we learned at the mill how the alpaca yarn was made and how to assemble yarn that would provide warmth and durability with various hand-knit apparel. We have a variety of yarn in natural colors as well as enhanced colors from our animals. To make your own sweaters, socks or baby items, just get some yarn in the desired weight and color and spend your time knitting or crocheting with Alpaca fleece. A new product --fleece that is ready to stuff your pillows. It is sold by the pound, and makes a comfortable pillow. You can also use fleece for dog beds and your animals will love the comfort of the bed. Our newest item to the Store are dryer balls made with alpaca fleece. They are noted to save 30% in drying time of your clothes. Available for purchase are a variety of items. Yarn, of course--2 oz skeins of black, several different browns, white, purple, blue and green blends done in 2 ply sport and DK weight. 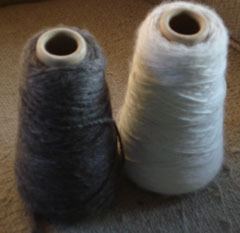 Yarn can be purchased in skeins or in cones of 2 or 3 ply sport or DK weight. Cones are usually at 500 or 1000 yard quantities, and the skeins are done in 100 or 200 yard skeins. More of our products can be seen at Browser's on the Square in Hammondsport, NY. 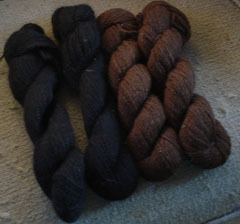 We also have rug yarn in black and beige that can be purchase directly at the farm as well as the yarn or pillow stuffing fleece. We also have hand-made scarfs, which are about 5-7" wide and between 45-52 inches long in a variety of colors. These carry several different patterns such as basket weave, and most with fringe. We have white, green, gray, various browns, beige heather, red, greens, heathers, black and several shades of purple. Mini-scarfs that will drape around your neck come in all the above colors as well. These are great to go under a coat, a sweater, a blouse when you want to add some warmth to your attire and still be fashionable. We have fingerless gloves in all the colors. Many desire these for driving, and for texting on their phone, particularly if you don't have a keyboard. Other products are neck cowls, headbands of two different styles, blankets and socks that are great for warmth, lightweight and do not itch like wool. We also have alpaca hats that are very fashionable and warm. .
We also have products at the Gold Mine Jewelry Store in Bath, NY and Browzers in Hammondsport, NY. Look at the pictures of some of the articles in the hand-made page.